Modern environmental requirements demand low noise levels for telecommunication cabinet products, especially when located in offices or urban areas. The spaces available are limited, and the power and electronics packaging density are increasing. Fans are commonly used to enhance the cooling of electronics by improving heat transfer due to higher air velocities. In this paper, noise measurements of air-cooled cabinets are analyzed, and possibilities to reduce the noise are discussed. Ordinarily, axial fans are used at the first stage to assist free convection, or the cabinet layout is designed from the beginning for forced convection. Axial fans generate a greater volume of flow, but less pressure. Thus, in compact and aggressive designs with high backpressure, mixed flow or radial fans can be less noisy. Figure 1. Noise powers of three manufacturers’ (A, B and C), 127-mm axial fans with same backpressure and airflow. In axial fans, the correct operating range is an important factor. When the pressure load crosses the capacity of the fan, noise increases significantly, but airflow decreases. Axial fans with equal interface dimensions and the same electronic power produce very different noise levels. Figure 1 illustrates the noise levels of 127-mm axial fans from three manufacturers. Fans A5 and B5 each have 5 blades and fan C7 has 7 blades. The curves have been measured with the same airflow and backpressure. The fan noise is proportional to the cabinet-induced total noise. Choosing a silent yet powerful fan is essential to total noise when the cabinet layout is fixed. Placing the fan too close to any obstacle can increase the noise by many dBs. An axial fan’s inlet side is especially sensitive, but in some cases a radial fan will produce less noise with a fingerguard (a thin wire web to protect people from being injured by rotating blades). Fan noise has two main components: blade passing frequency (and its harmonics) and flow noise. The spectrum of the cabinet product is not the same shape as that of the fan alone; see Figures 2 and 3. Blade passing frequencies (BPF) and harmonics are sharp peaks, flow noise is approximately 10 dB lower. In any case, if the BPF is totally eliminated from the overall noise level, the total value decreases only by approximately 3 dB. Figure 2. Base station spectrum (a third generation cabinet prototype with six B 5-type fans as the main noise source). Figure 3. Single fan spectrum (one B 5 with the same backpressure and rotating speed as in Figure 2). Airflow also makes noise in a cabinet without a fan. In Figure 4, a spectrum was measured by using relatively silent airflow through the structure. The shapes of the spectra in Figures 2, 3 and 4 give evidence that the blade passing frequency and flow noise can be treated and attenuated separately. The shapes of the airflow spectra are similar in Figures 2 and 3. The BPF peaks are similar in Figures 2 and 3. BPF is easily calculated from the number of blades and rotating speed. Figure 4. 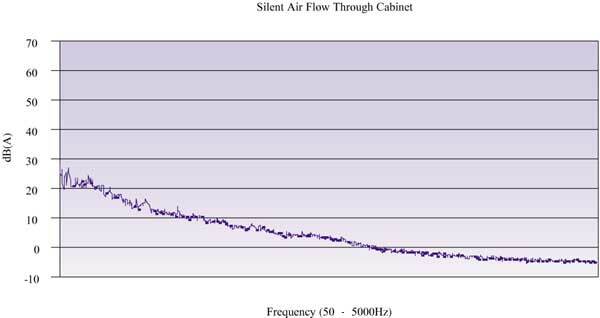 Airflow noise spectrum in the mentioned prototype cabinet. The rank order of the fans is not only dependent on the backpressure. In different cabinets, the rank order is subject to change; see Table 1, which compares weighted noise power results for Cabinet A (a prototype as in Figure 1), Cabinet B (a mock-up system for fan ranking), and a pressure box according the ISO 10320 standard. Because of the complicated nature and interactions of the BPF and especially the flow noise, determining successive rankings may require some very accurate mock-up geometry, or may only be possible with a prototype or a serial product cabinet. Noise can be decreased by reactive, passive and active means. Both reactive and passive means require space. A 3-dimensional, universal active solution is too complicated, requiring tens of microphones and loudspeakers and heavy signal processing. The cabinet’s mechanical cavities can act as resonant chambers. A resonant chamber has relatively small openings compared to other dimensions. Because of the reactive nature, a resonant chamber can act both as a silencer and as a noise amplifier. In principle, reactive acoustical components divide energy spatially or in the frequency range. In practice, some cavities act like a musical instrument’s resonant chamber. Different versions of cabinet models are possible including various components. This means that the cabinets are individual. The cavities and structures are, in general, acting as resonators rather than as attenuators. 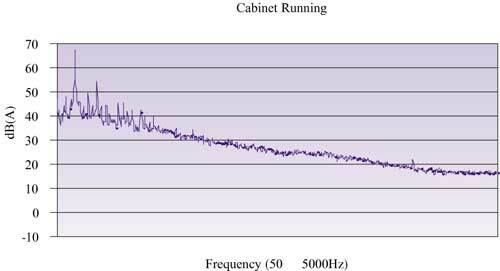 We have verified this by applying vibration excitation to the cabinet: the peaks in acoustical spectra are very sharp, meaning that the energy is not divided over a large frequency range but is causing strong vibration amplitude. Metal structures do not have significant vibration losses; usually in the cabinets they act as mechanical resonators and cavities act as acoustical resonators. When the space between the ceiling and roof was filled with absorbent material, the noise level decreased by 0.2 dB, and when spaces between the inner and outer side panels were filled noise level decreased by 0.2 to 0.5 dB per cavity. This experiment was made to verify the hypotheses that cavities act as resonators. The mechanical vibration does not have the same effect as noise because the same cavity panels damped with heavy carpet did not have an influence on the noise. Passive means (absorbent material transferring the noise energy to heat) are normally added afterwards. If airflow ducts or radial fan housings have free space, significant attenuation is possible. However, if the attenuation affects cooling, the added absorbent may require more fan power, and the total outcome can be negative: both noise and heat may increase. In these cases, finding the optimum solution requires further investigation. Fan noise has been a topic for active research for years. In earlier times, ventilation in buildings was of great interest. Sub- or supersonic fans are a great noise problem in airplanes. However, studies of this area are not very relevant for telecommunication cabinets induced air cooling noise because the air speeds are of different order. 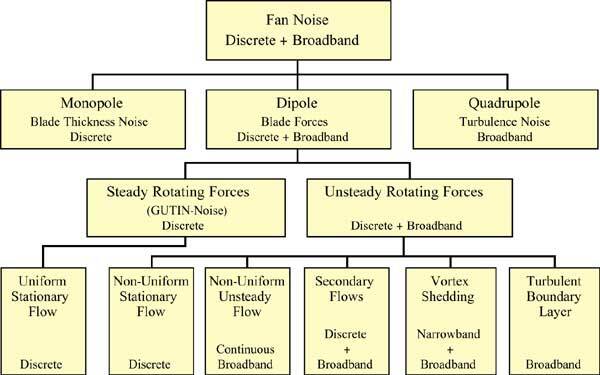 Neise  divides fan noise to many components; see Figure 5. The discrete components comprise the BPF and its harmonics, and the broadband is related to the flow noise, or steady horizontal line in the spectrum. Figure 5. Fan noise origin by Neise (1988). GUTIN-noise can be neglected; in other words, it is the noise blades make when distance from listening point varies. This noise should vary when the listening point is moved, and it should be zero in the axial line of the fan. Other phenomena are much noisier than this. The next component, non-uniform stationary flow, is the effect of blades in the non-uniform flow field. This noise is present in telecommunication cabinet use. However, the next component, non-uniform unsteady flow, is more dominant because the flow field in electronic cabinet use varies so much. Our measurements in the prototype gave pressure fluctuations 2 – 3 times greater than the mean pressure. These measurements underestimate the pressure fluctuations due to the relatively slow pressure measurement and relative large distance from blades. Secondary flows are a problem. See, for example, Longhouse . These should be investigated perhaps using smaller gaps between the fan blade tip and the venturi. The tip and venturi geometry is essential, and modifications should be done together with a manufacturer. Modeling of the flow field may also give some results for this; see Fukano et al  and M�hring et al . Vortex shedding is related to tip and blade geometry.Some tests have been reported in which modifications were made to the tip, or to a cord in the middle of the blade, or to a saw-shape at the leaving edges. Turbulent boundary layer might be the main reason for the broadband flow noise in telecommunication cabinet use. If the units to be cooled are located in turbulent flow too close after the fan, the interaction can strengthen the turbulence and thus, significantly, the noise. When using the “silent air” system described earlier, the flow to the cabinet was introduced by a tube, and the flow was laminar. When a cardboard cross-shaped structure, made with same dimensions as the fan motor support structure, was added to generate turbulence at the tube outlet, the noise level increased by 3 dB. Our interpretation of this result is that the turbulence caused by the cross (or the fan) does not have adequate time or distance to become laminar before the flow hits the units. Even a very small excitation vortex at the axial fan inlet may significantly increase the noise level, or, in some cases with radial fans, it may do the opposite. Fan noise prediction formulae are empirical; see Cudina . For analytical solutions, the problem is too complicated. 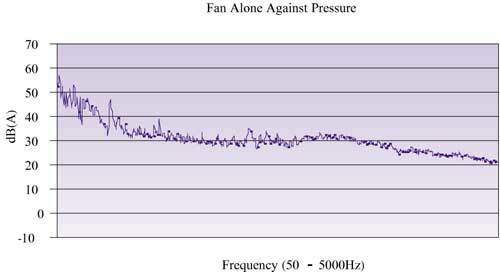 Most of the research done with regard to fan noise has attempted to investigate details or the effect of one factor. In practice, this may also cause unexpected behavior. For example, a grill near the inlet reduces the noise of a radial fan but increases the noise of an axial fan. A grill or a finger guard causes small disturbances to the inflow, but it is hard to predict how the fan is acting. Maximum noise levels specified in acoustic noise standards for electronic devices in general and telecommunication equipment in particular depend on the final location of the device. Noise levels are naturally most stringent for units used in office buildings or residences. Typically, acoustic noise level has been specified according to the relevant international noise standards (EU wide ETS 300-753, Bellcore in the USA , or national noise standards ). A new EU noise directive has been published and may influence future ETS 300-753 updates. The main noise source of telecommunication cabinets is the cooling fan, and the fan noise interacts with the cabinet structure and cavities in a complicated way. If the fan noise can be decreased, the total noise will also decrease. If noise is considered a part of the design from the very beginning, and enough space is reserved for passive noise attenuation, it is possible to achieve the required noise level. What about blade shape? The “sickle” shaped blades that air conditioners have seem to have no blade passing frequency peaks at all. Who discovered this? What is the underlying theory?